I visited the town of Lyngby, just north of Copenhagen, a couple of weeks back. It's actually called The King's Lyngby - Kongens Lyngby - but this ain't no history blog, now is it. The main street through the town centre is a lively, people-friendly stretch with loads of small shops. The city has laid out rough cobblestones on the street as a kind of traffic calming measure, mixed with old school aesthetics. 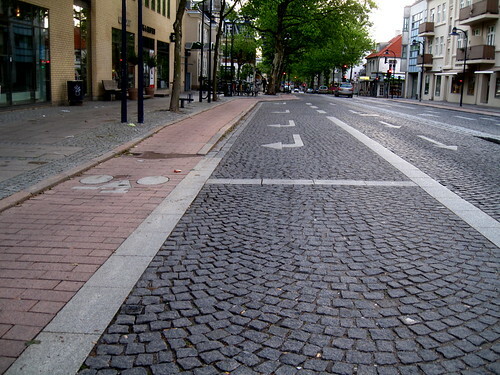 The cycle track is also unique in it's design, small paving stones to create a smoother surface. At this intersection, the stop line for cars is a good stretch back whilst cyclists can continue up to the pedestrian crossing, from where I took this photo. We're seeing a marked increase of stop lines for cars pulled back from the intersection, not least in Copenhagen, as reported a while back. 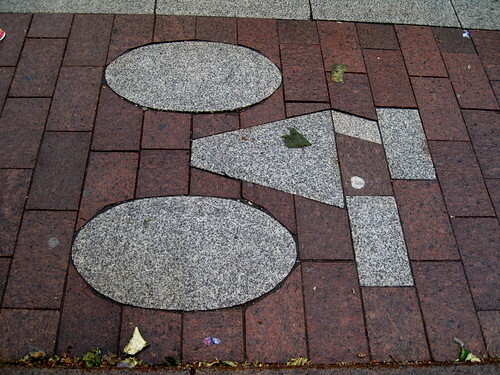 The pictograms are also quite unique on the cycle tracks, which adds to the general 'look and feel' of the urban design. I ain't no stone mason but the wheels tell us that cutting circles isn't the easiest task.